11.1 What Is an Earthquake? An earthquake is the shaking that results when a body of rock that has been deformed breaks and the two sides quickly slide past each other. The rupture is initiated at a point but quickly spreads across an area of a fault, via a series of aftershocks initiated by stress transfer. Episodic tremor and slip is a periodic slow movement, accompanied by harmonic tremors, along the middle part of a subduction zone boundary. 11.2 Earthquakes and Plate Tectonics Most earthquakes take place at or near plate boundaries, especially at transform boundaries (where most quakes are at less than 30 km depth) and at convergent boundaries (where they can be at well over 100 km depth). The largest earthquakes happen at subduction zones, typically in the upper section where the rock is relatively cool. 11.3 Measuring Earthquakes Magnitude is a measure of the amount of energy released by an earthquake, and it is proportional to the area of the rupture surface and to the amount of displacement. Although any earthquake has only one magnitude value, it can be estimated in various ways, mostly involving seismic data. Intensity is a measure of the amount of shaking experienced and damage done at a particular location around the earthquake. Intensity will vary depending on the distance to the epicentre, the depth of the earthquake, and the geological nature of the material below surface. 11.4 The Impacts of Earthquakes Damage to buildings is the most serious consequence of most large earthquakes. The amount of damage is related to the type and size of buildings, how they are constructed, and the nature of the material on which they are built. Other important consequences are fires, damage to bridges and highways, slope failures, liquefaction, and tsunami. Tsunami, which are almost all related to large subduction earthquakes, can be devastating. 11.5 Forecasting Earthquakes and Minimizing Damage and Casualties There is no reliable technology for predicting earthquakes, but the probability of one happening within a certain time period can be forecast. We can minimize earthquake impacts by ensuring that citizens are aware of the risk, that building codes are enforced, that existing buildings like schools and hospitals are seismically sound, and that both public and personal emergency plans are in place. 1. Define the term earthquake. 2. How does elastic rebound theory help to explain how earthquakes happen? 3. What is a rupture surface, and how does the area of a rupture surface relate to earthquake magnitude? 4. What is an aftershock and what is the relationship between aftershocks and stress transfer? 5. Episodic slip on the middle part of the Cascadia subduction zone is thought to result in an increase in the stress on the upper part where large earthquakes take place. Why? 6. Explain the difference between magnitude and intensity as expressions of the size of an earthquake. 7. How much more energy is released by an M7.3 earthquake compared with an M5.3 earthquake? 8. 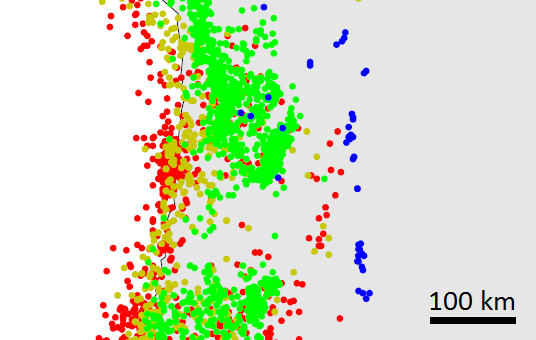 The map shows earthquake locations with the depths coded according the colour scheme used in Figure 11.11. What type of plate boundary is this? 9. Draw a line on the map to show approximately where the plate boundary is situated. 10. In which directions are the plates moving, and where in the world might this be? 11. Earthquakes are relatively common along the mid-ocean ridges. At what type of plate boundary do most such quakes occur? 12. The northward motion of the Pacific Plate relative to the North America Plate takes place along two major transform faults. What are they called? 13. Why is earthquake damage likely to be more severe for buildings built on unconsolidated sediments as opposed to solid rock? 14. Why are fires common during earthquakes? 15. What type of earthquake is likely to lead to a tsunami? 16. What did we learn about earthquake prediction from the 2004 Parkfield earthquake? 17. What are some of the things we should know about an area in order to help minimize the impacts of an earthquake? 18. What is the difference between earthquake prediction and forecasting? Chapter 11 Summary by Steven Earle is licensed under a Creative Commons Attribution 4.0 International License, except where otherwise noted.